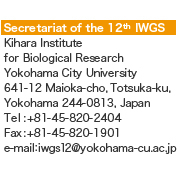 The Scientific Program Committee of 12th International Wheat Genetics Symposium invites all interested participants to submit abstracts for the oral or poster presentations. Abstracts will be selected and notified by the screening of Scientific Program Committee. If the abstract is accepted, each presenter must register and pay the registration fee via official website of the Symposium. Abstract will be withdrawn if the presenter does not register and pay the registration fee by the end of July, 2013. Oral Abstract Submission has been closed. Late Poster Abstract Submission has been closed. All abstracts can only be submitted online via this official congress website. To submit an abstract, authors are asked to submit through the submission form by accessing the “Abstract Submission” button below. If you are submitting an abstract for the first time, please register your personal information and create your account. After the account is created, proceed to submitting abstract. Fill out carefully all the required fields of the electronic abstract submission form. Only one table or image in JPEG format is allowed (included in characters count). The table or image should not exceed 16.5cm (L) x 6cm (H). Receipt of your submission will be sent to your registered e-mail address after completion of submission. Your abstract will be automatically edited according to the 12th International Wheat Genetics Symposium submission format, when you submit your abstract online. It is the responsibility of the presenting author and the submitter to review their own submitted abstract and to correct them if necessary until the abstract submission deadline. Submitters are responsible for any typing errors in the abstract. After an abstract has been submitted, modifications / cancellation can be made until the abstract submission deadline. Changes are not allowed after the Abstract Submission Deadline (Monday, May 27, 2013(UTC+9)). Please note that you cannot create another account if you have previously created one. Abstract submission is restricted to one oral or one poster communication per registrant. Papers that are authored by of the Plenary, Keynote, and Oral presentation speakers will be published in the Symposium Proceedings, which will be made available to all registered attendees after the Symposium. Please stay tuned for updates about the Proceedings.